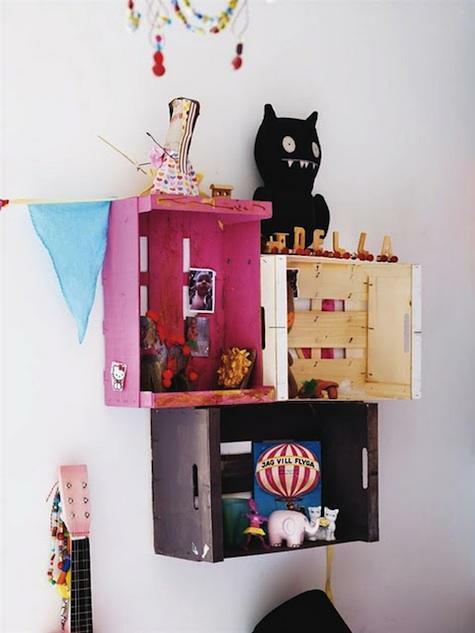 Nab some old wooden crates, paint them in bright colors, and wall mount them! Done! 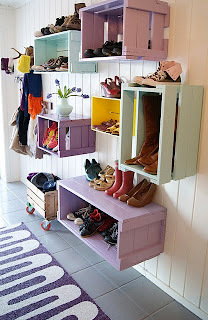 I could see this look working especially well in kids bedrooms, or even at an entryway. For a fun twist, designate a different crate to each member of the family, paint them all to each person's choosing, and use that crate to house objects such as shoes, gloves, scarves, and other miscallaneous items. It's a fun way to keep everyone organized. Now that I've got the idea in place, I just need to find some crates... any suggestions?